A good driving road needs three things: hills, curves and stunning scenery. Fast speeds are probably what you don't want - rather, you want to become part of the scenery you're driving through. Fortunately the Scenic Rim has the perfect road. South of Beaudesert with a turnoff from the Mount Lindesay Highway, the Lions Road takes you through hidden valleys and sub-tropical rainforests so perfect that you wonder which enlightened government official gave the okay for this to be built. The answer to this question is none. After the NSW Government rejected the idea of a road through Richmond's Gap in the McPherson Range, the Kyogle Lions Club (joined later by the Beaudesert Lions Club) helped plan, fund and build the road themselves. 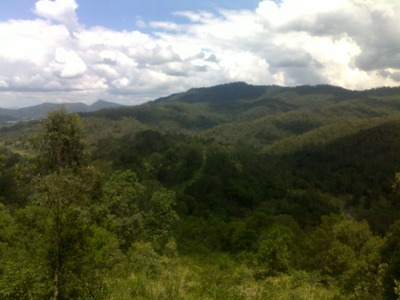 The road itself begins just south of Beaudesert. Head out of Brisbane down the Mount Lindesay Highway past Browns Plains, Greenbank and Jimboomba before stopping for any last-minute supplies in Beaudesert itself (tip: picnic foods will come in handy). Once through Beaudesert, keep an eye out for signs for the Lions Road itself - the Lions Club logo is a good indicator. When you first start on the road you'll notice a number of horse farms either side of the road. Drive a little bit further on and a beautiful valley starts to open itself up, filled with picturesque farmhouses and cattle idly grazing. You will have to watch out for these cattle as there are unfenced sections of road where wandering animals could make a mess of your day. 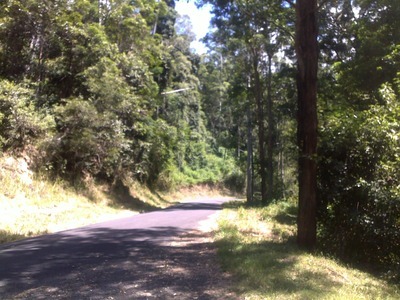 The Queensland section of the road runs alongside Running Creek, a freshwater creek you will cross numerous times. Those wanting to dip or picnic can do so at Andrew Dryman Park before going on a rollercoaster ride right up to the state border. The first thing you'll see at the border are some donation boxes from the local Lions' Clubs. These funds go back into maintaining the road, so make sure you chip in. The second thing you'll notice are the trees. The original forests are still here and show you what the area would have looked like pre-European settlement. Just over the border you can pull over and look out over the rainforest; the only sign of human life being the Sydney-Brisbane train line that loops over itself as it crosses through the McPherson's Range. Looking out over the Spiral Loop on the Sydney-Brisbane rail line. Continue further south and the rainforest eventually gives way to small farms and properties again. You'll cross over many of the original wooden bridges as you head south down towards the Summerland Way, at which you can either turn left for Kyogle and Murwillumbah or right for Woodenbong and Warwick. Either way you can't go wrong - it's more roads through the beautiful Great Dividing Range. Not quite as good, but after a trip down the Lions Road, everything else seems just a little less special. Please note that there are weight restrictions on the NSW section of the Lions Road. Why? One of the best driving roads in the country. If you are going to go on the Lions Road, please remember to pull off whereever possible to let other cars passed. Thanks for a great read! This drive sounds like the perfect day out with the family and something a little different to the usual coastal drives. I'm putting it on my calendar for an upcoming weekend activity. Metgasco are putting a gas pipeline right throught his beautiful part of the world, which has beautiful clear creeks, dairy farms, rainforests and the flora and fauna related. Check out the Metgasco website where they have a map of their path of destruction. We travelled to Lions Road yesterday. It is really is gorgeous though make sure you head to Rathdowney. Sign posting is a bit dismal. The maximum load limit on the bridges ranged from 4 - 6T and there are some very low rail bridges. The scenery is spectacular and well worth the drive.